Angus and Braveheart are best of friends. These two had been through so much together, but they never left each other’s side. 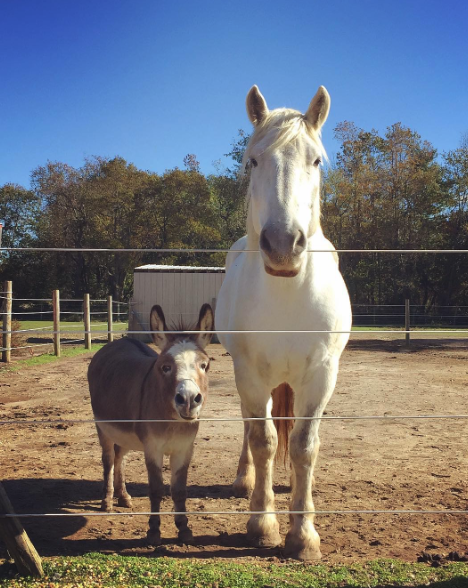 Their friendship is sort of unusual, and if you ask why, it’s because Angus is a tiny donkey, and Braveheart is a pretty tall horse. But they seem not to care about their differences, because they complement each other just perfectly. Their story is pretty amazing. Both were rescued and taken to the Oasis Animal Sanctuary in Franklinville, New Jersey. One day, a human entered the place, and the two friends felt strong connection to her. Could she be the person to take them home and love them unconditionally? They were sure she was, and they planned on ‘telling’ her that using their sweet sparkling eyes. As this woman finished her visit at the sanctuary and headed towards her car, she decided to turn around once again and say goodbye. Instead, she saw Braveheart and Angus standing at the fence, looking straight at her. That’s when she knew the two belonged with her. Instead of getting home, she filled out an adoption application and that was the start of their new life together. We know this story resembles a fairy-tale, and if you take a look at the video below you’ll know how Braveheart and Angus really live in one. You can see all of their adventures on their Instagram account.